Welcome to our 2006 list of the 10 best planning, design, and development websites. We have revamped our Top Sites format -- now, instead of listing the top 50 sites and including repeat listings for consistently good sites, we are listing the 10 best new or substantially improved sites each year. Many of the previous Top 50 sites are still worthy of praise, but the following 10 sites represent the best new or improved resources the Internet has to offer for those interested in planning, design, and development. Please post your comment on this list below, or contact usif you have nominations for next year's list. Although other impressive city planning department websites exist, the historic city of Alexandria, Virginia's, website stands out among the pack for the range of information and tools it provides. 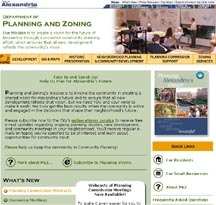 The Department of Planning and Zoning website's long list of features includes Planning Commission Webcasts, an email newsletter, detailed profiles of planning initiatives (including recent documents), a fully featured GIS system, a guide for small business, an informative section on historic preservation, a complete set of applications and forms, and links to the full city charter, zoning code, and zoning digest. Although it contains too many hidden links to PDF files and is missing online permit application and status checking, Alexandria's site remains impressive. "Planning and Zoning's mission is to involve the community in creating a shared vision for Alexandria's future and to ensure that all new development reflects that vision. But we need YOU and your voice to make it work! We truly get the best results when the community is active and engaged in the decisions that shape their neighborhood's future." This stunningly elegant Flash site combines social and building history with technology, creating an intimately local yet expandable and replicable model for neighborhoods around the world. It promotes the preservation of local culture and history and successfully partners with lectures and tours, while including online lesson plans for teachers and activities for kids. "Curating the City is a new educational program from the Los Angeles Conservancy that treats the city as a living museum, offering a fresh look at L.A.'s architectural and cultural heritage. Through architectural tours, related events, and permanent resources, Curating the City encourages the ongoing exploration -- and appreciation -- of L.A.'s unique built environment. The pilot program for Curating the City focuses on the great Wilshire Boulevard, whose story reflects that of Los Angeles itself." The original "New York City Neighborhoods and Real Estate Blog" has expanded to include a growing community of sites, including Curbed Los Angeles and Curbed San Francisco, as well as Gutter, an architecture blog, and Eater, a restaurant blog. Indisputably gossipy and irreverent, and sometimes antagonistic, the Curbed sites are always entertaining, and provide the planning and development community with some of the best insider information about local development efforts, often long before it reaches the mainstream media. "In New York City, it all comes back to real estate, rent, and the neighborhoods we inhabit. Since its launch in May 2004, Curbed has established itself as the center of the virtual conversation about real estate in Manhattan, Brooklyn, Queens, and beyond. Sales and rental prices, celebrity deals, new developments, amusing broker stories, hot restaurants, and the latest neighborhood gossip -- it's all on Curbed. Updated a dozen or more times throughout the day, and liberally spiced with reporting and dish from readers, Curbed has become a daily fix for tens of thousands of NYC residents -- and the most-trafficked neighborhood and real-estate weblog on the web." "Curbed is a gossip site, and publishes rumors, conjecture and opinions, as well as accurately reported factual information. The site may contain errors or inaccuracies." Ever gotten lost on the U.S. Census website? Looking for an easy-to-use resource to compare stats on cities, counties, and states? DataPlace is the place. 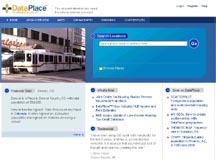 Created by the Fannie Mae Foundation, which also runs the award-winning housing site KnowledgePlex, DataPlace allows users to rank locations by a wide array of categories such as population density and homeownership rate, as well as build thematic maps and scatterplots based on the information. "DataPlace is your free online source for housing and demographic data about your community, your region, and the nation. With DataPlace, policy makers, practitioners, members of the media, and scholars of housing and community development can analyze, interpret, and apply data to make educated decisions and inform others. DataPlace makes it easier than ever before to access housing and demographic data and display this information in colorful, customizable maps, charts, tables, and other formats." The Nolli Map has been a critical tool for understanding Rome for over 250 years. The Interactive Nolli Map website, developed at the University of Oregon, provides users with a variety of opportunities for exploring one of the most influential settlements, and maps, of all time. Satellite images of the city are overlaid with graphic highlights including city gates, districts, pathways, fountains, and gardens, among others. Conventional cartographical knowledge is integrated with state-of-the-art technology and top-notch scholarship. Extensive documentation includes articles, essays, a glossary, and a bibliography. "The Nolli Web Site presents the 1748 Nolli map of Rome as a dynamic, interactive, hands-on tool. The public now has access to cataloged information about the map in both written and graphical form. The map not only provides rich information, but it has the ability to be updated with new data over time to embrace expanding knowledge...[The map,] regarded by scholars and cartographers as one of the most important historical documents of the city, serves to geo-reference a vast body of information to better understand the Eternal City and its key role in shaping Western Civilization. The Nolli Map Web Site introduces students to Rome and the structure of its urban form; it illustrates the evolution of the city over time; and it reveals diverse factors that determined its development. Above all the Nolli Web Site is intended to provide a vehicle for students and teachers around the world to explore and facilitate creative thought." MIT's groundbreaking OpenCourseware initiative allows users to search, read, and learn from the material of over 1,250 actual MIT courses for free. Since its launch several years aog, the site now includes an impressive offering of over 100 courses in the Urban Studies and Planning subsection, and anyone can access course content including syllabi, reading lists, assignments, student papers, class discussions, and exams. "[MIT OpenCourseware (OCW) is] a free and open educational resource for faculty, students, and self-learners around the world. OCW supports MIT's mission to advance knowledge and education, and serve the world in the 21st century. It is true to MIT's values of excellence, innovation, and leadership." "MIT OCW's goals are to (1) Provide free, searchable, access to MIT's course materials for educators, students, and self-learners around the world, and (2) Extend the reach and impact of MIT OCW and the 'opencourseware' concept." "The Department of Urban Studies and Planning, established in 1932, was the second planning department in the U.S. and today is one of the largest planning departments nationally. DUSP excels at theorizing from practice and is particularly interested in how decisions are implemented and the impacts and benefits on those affected." Washington State's MRSC is a model of regional cooperation. Organized by the state legislature, MRSC serves as a communal resource for local governments to interact with each other and with the state itself. The site includes an impressive repository of information, including profiles of cities and counties, an index of planning ordinances, sample government documents like job descriptions and RFPs, and general background information on planning topics from economic development to housing and information services. "MRSC's Web site is one of the most comprehensive local government sites in the United States. 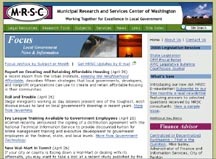 This site can be used to search the Revised Code of Washington, Washington Administrative Code, municipal and county codes, and other information relevant to local governments. Information is available to all citizens with web access. More than 175,000 users a month currently visit our site." Comparable to DataPlace, but with a more user-friendly format and local focus, former Top Site Neighborhood Knowledge, California (NKCA) 2.0 has undergone a complete makeover. The site now features a host of impressive features, including GIS-driven custom geographies -- which users can build using unique themes and uploaded data -- as well as statistical analysis by census tracts, cities, and counties. The map room, data and charts, and frequently expanded capabilities make this a model for other state GIS/data sites. "NKCA is an innovative online resource for neighborhood research in California. Coupling a user-friendly mapping interface with colorful charts and maps, NKCA empowers people -- in need of timely, local data -- to produce informative reports. Moreover, NKCA enables people to quickly create their own GIS (Geographic Information System) maps that can be integrated with baseline demographic data." A self-proclaimed clearinghouse of information, PBIC offers guides, quizzes, software and more designed to improve bicycle and pedestrian access and safety. The wide-ranging network of sites features clean visual design, easy navigation, a large image repository, training, published research, and more. "The PBIC is a clearinghouse for information about health and safety, engineering, advocacy, education, enforcement and access and mobility. The PBIC serves anyone interested in pedestrian and bicycle issues, including planners, engineers, private citizens, advocates, educators, police enforcement and the health community." Yes, Wikipedia, "the free encyclopedia that anyone can edit" with over 1.1 million articles in English (not to mention many other languages) has produced an easily navigable, open source...encyclopedia of information on architecture and urban planning through its architecture "portal". The ever-expanding resource includes a first-rate primer on everything you need to know, with feature articles, important dates in history, news, subcategories (including urban planning), and a fun "did you know?" area. "Begun in 2001, Wikipedia has rapidly grown into the largest reference website on the Internet. The content of Wikipedia is free, written collaboratively by people from all around the world. This website is a wiki, which means that anyone with access to an Internet-connected computer can edit, correct, or improve information throughout the encyclopedia, simply by clicking the edit this page link (with a few minor exceptions, such as protected articles and the main page)." "Portals are pages intended to serve as 'Main Pages' for specific topics or areas. Portals may be associated with one or more WikiProjects; unlike WikiProjects, however, they are meant for both readers and editors of Wikipedia, and should promote content and encourage contribution." Planetizen welcomes reader comments on the 2006 Top 10 Websites List. Please add your comment here. If you have any questions or comments regarding this list please contact us at info@planetizen.com.